You have all, at one stage or another, done some pretty darn stupid thing to your PC, but this, I am afraid, is at least a contender for "Stupidest thing ever"(TM). I opened my PC last night, and noticed the incredible amounts of dust clinging to all the important cooling-things-down bits, so I decided to clean it all out. I even took off the AVC Sunflower cooler, (as recommended by Dan from Dan's Data), and took it to the sink to clear out the gunk from between the fins. I turned it over, and noticed something strange, a small blue tab of plastic. Intrigued, I lifted it up with one finger, and proceeded to PEEL OFF THE PROTECTIVE PLASTIC COVER FROM THE COPPER BASE OF THE HEATSINK!!! It had been there, in between CPU and heatsink, in a drastically overclocked system for nearly 12 months! People do this all the time. Usually, they only do it once, because usually, the results are Not Good. You got away with it because, as I've said before and will now say again, P4 CPU coolers generally work much better than they need to. It's possible that your CPU spent a fair amount of time in its speed-throttled heat-reduction mode, mind you. Sometimes, it's entirely forgivable that people miss the plastic. Many CPU coolers don't have plastic stuck on the bottom of them; people who've installed CPU coolers before, but never one with plastic, don't think to look for it. It's not always easy to see, either. Some coolers, like this old Thermaltake Chrome Orb, have coloured plastic with an obvious pull-tab. If you miss that, you may need an eye exam. Some coolers, however, just have coloured plastic. 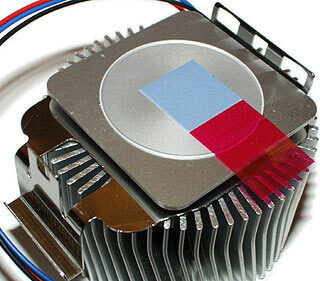 Some coolers have clear plastic, with no pull-tab, and sometimes not even any pre-applied thermal goop underneath; the plastic's just there to protect the polished finish on the bottom of the heat sink. If there's no little instruction leaflet telling you to peel the plastic off, and if the plastic isn't even visible without quite close inspection, then I don't think you commit much of an offence if you fail to notice it. 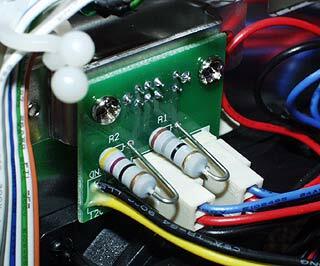 I have a question about the built in fan speed controller switch in Lian Li cases (the PC-65USB to be specific, in case they're different). What is the rating for the controller - i.e., what power rating fans can it control? The standard fans are ADDA units with stats of 0.15A and 1.80W. Would the controller work if I swapped the two ADDA fans with, say, Enermax speed dial fans? The rating for them is 0.23A and 2.76W. As I am not very knowledgeable with electronics stuff, do you have any recommended online reading material? I think the Lian Li speed controllers are all the same, but I haven't checked lately. It just uses a couple of fat resistors. One's 47 ohms, one's 18 ohms, at least in the elderly PC-60 controller in the above picture. The fans are wired in parallel, and the 18 ohm resistor is in series with the both of them at medium speed. The 47 ohm one is in series at low speed. There's no resistor in series for full speed. The resistors, judging by their size, are one watt units; there's a bit of air flow around them, but given the long duty cycles they have to put up with, I don't think it'd be a good idea to ask them to dissipate a lot more than one watt. If you just shorted out the fan pins, to give the maximum possible load on the resistors (and make some smoke and blow a PSU fuse, if you tried the full power setting), then you'd be asking for 8W dissipation from the 18 ohm resistor and 3W from the 47 ohm one. This is pretty easy to work out, following Ohm's Law (voltage equals current times resistance, V=IR). The medium power resistor is always going to be the one that works the hardest, with any size of fan. If it's not overloaded, the low power one won't be either. If we assume the standard fans have a run current of 150mA - run current is usually below rated current, but let's leave some headroom - then that means they're looking like an 80 ohm resistor to the circuit. Brushless fans don't behave like pure resistors when you change their input voltage, but they should be near enough for this back-of-an-envelope calculation. So - two 80 ohm resistors in parallel gives us 40 ohms, which plus the 18 ohms of the medium power resistor gives a total circuit resistance (disregarding wires and connectors) of 58 ohms. That gives 207mA current from 12 volts, so the 18 ohm resistor's dropping 3.72V (voltage across resistor equals current through resistor times resistor value; V=IR again) and dissipating 771 milliwatts (power equals current times voltage). Pretty close to its probable ceiling rating, in other words. A couple of .23 amp fans, like the Enermax ones at their full power setting, in parallel would represent a 26 ohm load. That, plus the 18 ohm resistor, would give 272mA current from 12 volts, which is 4.9 volts dropped over the 18 ohm resistor, which is 1.33 watts dissipated. That'd be about as far as you'd want to push a one watt resistor. So, given the lower actual run current of the fans compared with their ratings, you could get away with using the fans you suggest. Just not anything very much more powerful. Of course, if you used those "speed dial" Enermax fans, you wouldn't need to use the Lian Li speed controller at all; they have their own speed control. You could leave the Lian Li controller set to full power, or plug the fans in somewhere else, or whatever. To get you up and running in basic electronics, you may find the guide here helpful. Yesterday I purchased an Eternalight Ergo Marine LED flashlight [as reviewed here] from Technology Associates. I liked that red LEDs are available, and that there's no magnet. In any event, I noticed later in a Q&A on the Technology Associates site something to the effect that they can only guarantee that the "Elite" models will have the highest quality LEDs. "Currently our units are all getting highest rank bulbs. However, Elites are always to get the highest rank available for production. So, there is no guarantee that an Ergo Series light will have the same caliber of LED." I did not realize that I could be getting second rate LEDs and do not feel good about finding out from a Q&A. I haven't decided if I'll just return the unit (because I really wanted the Elite, but with red lights and no magnet), but how would anyone know if they got second rate LEDs? And what is the difference? The difference between top brightness rank LEDs (the ranks are named differently by different manufacturers) and others is seldom large. There's colour ranking as well, and colour and brightness are often linked. White LEDs are the only ones that this applies to in a really noticeable way; because of variance in the phosphor deposition process, some of them are a bit brighter than others, and there's always a little bit of hue variation from LED to LED - some a bit greener, some a bit bluer, et cetera. Coloured LEDs can have substantial brightness differences, but it's seldom a big deal. You can't usually see a difference between normal and top-rank LEDs unless you look at the LEDs next to each other. Battery strength generally makes a much bigger difference. Since the manufacturers say that everything's currently getting top-rank LEDs, then presumably, that's what you've got. Even if you haven't, though, it's a bit unfair to categorise regular-quality LEDs as "second rate". Second rate LEDs would be, in Nichia coding, the lousy "Q" rank. You'd have grounds for complaint if someone was using those in their lights, but not if they use the regular "R" rank LEDs, which are the ones that live up to the quoted brightness. "S" and brighter ranks are just a bonus; they're the premium die-cut foil-stamped product, as it were. There's a bit more info about this here. I work on my laptop at the University library. From where I work, in the middle of the room (comfy chairs there! ), I am some 25-40 feet away from the nearest Ethernet wall jack. I have batteries to dispense from connecting to the outlet, but I'd also like to be connected to the network. The University doesn't have wireless Ethernet installed. a) buy a long cable and run it across the floor. b) buy a wireless networking access point and PCMCIA card and hope it works. The AP would have to be small, though. c) What about Bluetooth? It seems there are machine-to-machine USB Bluetooth networking thingies, but what about RJ45-jack-to-machine? d) Ideally, I'd like a "virtual patch cable" with plug-and-go functionality. Some little box that'd plug directly to a RJ45 jack, and another one to plug into the RJ45 jack on the laptop (or maybe USB). Are any of these solutions practical? I'm assuming that there aren't any university IT types who'll come and whack you with a bat for installing unapproved hardware that infringes network security policy blah blah blah. If not, then two of these ought to solve your problem very easily. The long-cable-across-the-floor solution is, of course, the cheapest by far; if the library staff don't mind you doing it, and if you stick it down with gaff, roadie style, so people can't trip over it (or if you can tuck it under the carpet - are there carpet tiles? ), it'll work fine. I am planning to spend some money on a Tamiya 1/16 R/C-Tank, but I can't decide which one. Still in the race are the Sherman and the Tiger, either one in the "full option" version. Now here's the catch - what's "full option"? The Tiger will even recoil the gun and rock back on the tracks when "fired" - the Sherman doesn't? Do you have to hand-move the turret? What accounts for the 200 Euro difference in price? For a German such as myself, driving around a Tiger model always attracts opinions such as "one's attempt to recall the 'good old times'", so the Sherman has that pro over the Tiger. I am not a Nazi and will not be called one because of the R/C toy that I own. Have you had a chance to compare the two kits? How old is your Sherman? I don't think the 56014 Full Option Sherman kit (see here and here) has gun recoil; I think it's got all of the other functions that the Pershing I reviewed has, including main gun chassis kick-back, though. The 56018 King Tiger has everything including gun recoil; so does the 56010 Tiger. Although they're all very mechanically similar, the Tigers are bigger models with more parts; that has an impact on the price by itself. As far as the avoiding-looking-like-a-Fascist-by-accident thing goes, if you avoid putting an authentic Waffen SS paint job on your tank, and possibly opt for daisies and peace symbols instead (Hey, Ferdinand Porsche was involved; go ahead and put a Volkswagen badge on it too! ), then I reckon you ought to be off the hook. My Sherman is the pre-Full-Option one, with just the drive motors and no light-and-sound anything (well, as standard, anyway...). That kit's pretty hard to find these days, although there are usually a few really old second hand Tamiya tanks out there from the days of their single motor, dual-clutch drive system. In your "Building an LED caselight" tutorial, you caution against overstressing a resistor, with regards to how much power it can dissipate. Toward the bottom of the article you state that you needed a 3.3 ohm resistor, and that it would dissipate about 450mW. In my Jaycar catalogue I can't find a 3.3 Ohm resistor rated at a 1/2W, only at 1/4W. How many watts was the resistor you used in this project rated for? I just used a one watter - the one-watt range has RR-2xxx numbers in the Jaycar catalogue. It doesn't hurt to use something with too high a power rating, and one watt resistors aren't unmanageably large. Can you tell me where to obtain (hopefully not too costly) a meter that would measure human electro-magnetic field/flux levels. I asked some shops here and all give me negative answers. I want to do experiments measuring different people, myself included. Electric currents flow in human beings, but they're very low level and go in all directions, so electro-magnetic radiation (EMR) from a human being is very, very weak. Just detecting contractions of muscles isn't that hard; an electrocardiogram works by detecting the millivolt-level potential differences on the skin as the heart pumps. But even then, the amplifier between the ECG's electrodes and its readout needs to be able to reject common mode noise (potential differences between the electrodes and ground, as opposed to the differences between electrodes, which are what you're looking for) very well, because ordinary electrical equipment in the area will emit enough EMR to create common mode noise much stronger than the heartbeat signal. And this is with the electrodes touching the skin, metres away from the noise sources. Imagine how much harder it gets when you're trying to detect the feeble EMR created by human body electricity, rather than the electricity itself! Electro-encephalography does the same sort of thing as an ECG, but it, again, uses contact electrodes, not an external EMR detector. None of the other brain imaging systems looks at neural EMR; there's a handy crib-sheet page on the main brain imaging technologies here. Human electromagnetic emissions can be detected, but only in a very expensively shielded room, using exquisitely sensitive instruments - Superconducting Quantum Interference Devices (SQUIDs) are the state of the art. With those, you can actually study electrical activity in the brain directly, but non-zillionaires need not apply. There's a colossal amount of nonsense talked about this stuff. People asserting that ultra-low-power magnetic fields can be used for mind control, or that their Radio-Shack-components box can diagnose illness by measuring body conductivity, et cetera. I'm afraid there's no way for you to really do what you want to do. There are plenty of people out there who'll help you pretend to do it, though. Apparently, you can make a quite good living that way.